What are the top 10 questions to ask before entering a drug and alcohol addiction treatment center? There are many different levels of substance abuse treatment. Some of these include detox, residential, inpatient, intensive outpatient (IOP) and most likely a sober home. However, it goes much deeper than just the levels of care. If you are a parent reading this article, chances are you are looking for advice to help your young adult. Your son or daughter may need a young adult drug rehabilitation program in New Jersey. First, you should know that you are not alone. The Centers for Disease Control (CDC) estimates that 48 million Americans used illegal drugs in the last year. About 20 percent of teenagers under the age of 16 reports using alcohol. And, of those, more than 60 percent binge drink. According to the CDC, drug and alcohol use is one of the leading causes of death for teenagers. In addition, the number of drug overdose deaths is rising. Maybe you are worried about your son or daughter. You know that they need a substance abuse treatment program specializing in young adults. Perhaps you are worried your son or daughter needs one of the drug rehabs New Jersey offers. You may have questions about how to get someone into rehab. Here are some important questions youâ&#x20AC;&#x2122;ll want to have answered when looking for a program. We hope our list of questions will help you find the answers you seek about rehab for young adults. eligibility into the rehab facility in New Jersey. Finally, as a parent, you will also want to know when your young adult can begin treatment. 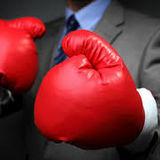 Mental Health and Substance Abuse Assessments Are Necessary The National Institutes of Health notes more 8 percent of people with addictions also have mental health conditions. Called a co-occurring disorder, it is not unusual for young adults to suffer from one. There is a strong connection between mental illness and substance abuse. Therefore, itâ&#x20AC;&#x2122;s important either an alcohol treatment center in New Jersey or drug rehab center in New Jersey test them. If they have a mental health issue, the center can address it during the treatment phase. Parents need to ask the treatment program if its screens for mental health issues. They also need to know whether a mental health treatment program will be a part of their young adultâ&#x20AC;&#x2122;s treatment. In addition, parents may want to ask the facility if it believes in using drug therapies to treat mental illness. Parents Need to Understand Integrated Substance Abuse Treatment Parents may also want to ask about integrated treatment programs. Research has proven that this type of treatment works for people with both mental issues and co-occurring disorders. Integrated treatment programs try to combine as many programs for the social and emotional health of young adults as possible. Integrated treatment programs are usually longer than other inpatient treatment programs with drug rehabs New Jersey options. They include vocational or educational resources, medical resources, and community resources. They allow your son or daughter to receive the most comprehensive care possible. Parents may also want to ask if there are social programs within the facility. And, if the answer is no, ask if there are there any outside it. These programs allow young adults to make friends with people who do not use drugs or alcohol. Are the employees happy and devoted to their jobs? What types of degrees and certifications do staff members have? If there’s a psychiatrist on staff, does he or she have a license in adolescent or adult psychiatry? Are there staff members who have a license through an association for social workers or treatment counselors? Be sure to ask about the culture and climate amongst clients and staff. Ideally, you should visit the center and hang around for a while to witness the activity. 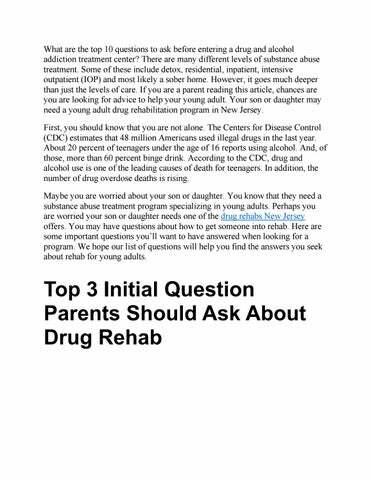 To guarantee your son or daughter has the best possible drug rehabs New Jersey addiction treatment care, you must have all these questions answered. Depending on how old your young adult is, you may also want to ask about educational resources. Does the center have educational and medical staff to guarantee your young adult is getting everything he or she needs? Do not hesitate to ask as many questions in this area as you want. They are the key to any good outcome for treatment and recovery. Will My Insurance Pay for Addiction Treatment for My Child? Another question to have answered is how can I pay for the treatment for my child? This is almost as important as knowing the qualifications of the staff at treatment centers in New Jersey. While some New Jersey rehab programs will tell you automatically about the costs associated with their treatment, others may not. There are questions you can ask, firstly, how much will the program cost? Different types of substance abuse treatment drug rehabs New Jersey addiction programs have different costs. The cost depends on the type of treatment and the length of stay. Also, the level of treatment matters. Let’s say, for example, your son or daughter must go through a detox center before being treated. There is an additional cost for that. Inpatient drug rehabilitation is more expensive than intensive outpatient rehab programs. Many treatment centers offer payment plans or financial aid. You will want to ask the center if it has this type of program is available. Parents may also want to ask if the program offers a sliding scale. Most programs based their sliding scale fees on the amount of money the young adult makes. The center can also base the scale on the amount of money you make as his or her guardian. A Few Additional Questions Parents Must Ask 1. Of course, there will be additional questions you may want to ask any drug rehabs New Jersey addiction treatment program. You should definitely ask about licensing. Is the facility licensed through the state? Nearly all states require that drug rehabilitation programs or alcohol treatment centers have licenses. If you do not trust the center’s assurances, you can always ask to see the license. Every licensed facility should have its license prominently displayed. 2. Also, each center needs to go through the accreditation process by the state in order to keep its license. You should ask the treatment center when it last went through accreditation. In general, most states require that treatment programs go through the accreditation process every three to five years. 3. Parents may also want to ask about how involved the family will be in the treatment process. Is family information used as part of the therapy for the young adult? Who will see the family’s information? Will the center keep the information private? You will also want to ask about the privacy of your son or daughter’s records. Will the treatment program use the information for research? If so, you need to know whether it will use the information anonymously and for research purposes only.